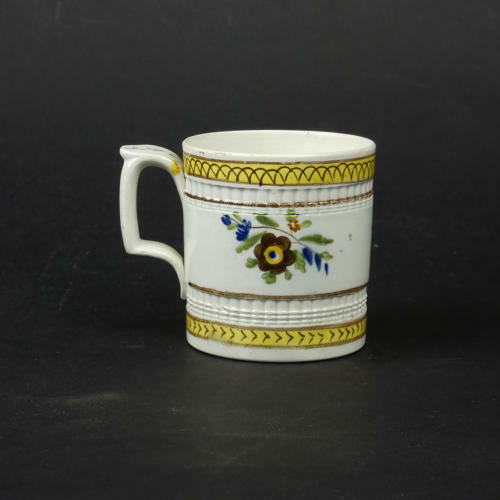 A small Prattware mug dating from the end of the 18th century, c.1790. This is a charming little piece and it would have been made as a child’s mug. It is lightly potted, in pearlware, and it is decorated the typical Prattware colours of ochre, brown, green, blue and iron red. There are also engine turned bands to the mug just beneath the rim and above the foot. There is a very tiny chip to the inside of the rim and there is a smudge to the glaze, where it has touched on something in the kiln. Price includes postage within the U.K. Shipping to the U.S.A. add £15. Western Europe add £7.